The Lambton Worm is a fine example of a Dragon or Wyrm or Sea Serpent that you can include in your game, and even features a built in tactic for slaying the beast at the climax. And a death curse. Wow. Who doesn’t love a death curse? Click through for the full story of the Lambton Worm and how it might fit into your campaign. I’m currently trying to figure out to hook it into the Elder Worm mythos of the HERO universe. Two threads about immortal worms have to tie together eventually. [*] Post title courtesy Samuel Taylor Coleridge. Fun fact: The Rime of the Ancient Mariner fits the theme tune of Gilligan’s Island pretty nicely. After the apocalypse, when the nanite swarm blankets the world, only a few of the gestures capable of activating its various functions survive, passed down as jealously guarded secrets in mystery cults and esoteric orders. They are not dissimilar to mudras as Mage: the Awakening used the word. Depending on the mudras one knows, experimentation could be the equivalent of issuing all sorts of system-rending commands, without necessarily knowing if the manipulator has authorized themselves as a super-user yet. The nanite equivalent of rm -rf could be utterly catastrophic, depending on what it considers files and directories. After the apocalypse, when the nanite swarm blankets the earth, some of them will form coalitions to recreate some of the silly bipeds by merging together into biomechanical organisms. Because what else are you going to do once you’ve blanketed the earth and everyone who wants to has built their interstellar vehicles? So there’s Paris syndrome, Jerusalem syndrome and Stendahl syndrome, which is linked to the city of Florence. Think about the madnesses cities impart on their visitors: hallucinations, derealization, obsessive ideas and more. In a role-playing game, a city may have a very palpable effect on people foreign to its bounds. The citizens seems perfectly normal, but they are acclimated to the conditions. The traveler cannot handle the city’s influence and their mind cracks under the pressure. Or the citizens seem mad to the outsiders, but their perceptions and actions are perfectly normal by local standards. Slowly the visitor finds themselves slipping into a matching perspective and modes of behavior. It can go both ways. The city may affect its people, but the people affect the city. If the population changes enough, the character of the city changes. We see that in real life all the time as large scale population change affects the culture and tone of a community. In a role-playing game, that change could be more visibly expressed in the metamorphosis of a city’s genius loci — or City Fathers, as Werewolf: the Apocalypse called them — or even a struggle between different entities, a la the Invisible Clergy of Unknown Armies. Imagine if every city had its own pantheon of City Fathers, expressing different aspects of the community. As the population changes, so the influence of those spirits rises and falls. That particularly reminds me of Al-Amarja from Over the Edge. The citizenry have any number of curious practices, like nooses for neckties. The people who stay there long enough start to assimilate, intentionally or otherwise. Suppressed Transmission was a column written by Kenneth Hite for Pyramid, Steve Jackson Games’ role-playing magazine. 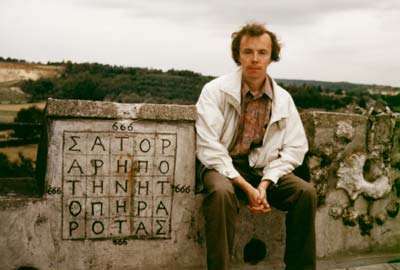 For more than 300 columns, Hite frolicked through the fields of history — real and alternate — the occult, paranormal and high weirdness. It was time traveling reptoids one week, the six faces of Jack the Ripper the next. It was a little bit historical fact, a little bit delirium and conspiranoia. Plot seeds, characters, campaign frames, you name it, Hite made them out of the oddities of human civilization for your inspiration and role-playing pleasure. It went on like that for years. And it was most enjoyable. Then Pyramid‘s format changed, the column ended and — this is the important bit — the archives became unavailable as subscriptions ended. You can still get a taste of Suppressed Transmission through the two collections sold through e23, including the previews available for both. The collections comprise about three dozen columns each from early in the run. The material is heavily annotated and cross-referenced, so those two books have a lot of value added in compared to the columns as they were originally published. I bring this up because a little over a year ago, I and some other ardent fans of Suppressed Transmission — Chris Helton, Jürgen Hubert and Stéphane Gallay, among others — kicked around the prospect of a grassroots effort to convince Steve Jackson Games it would be worth their time and energy to collect and release the unpublished columns in some format or other. Jürgen in particular began a “Where I Read” thread on RPG.net in which he read through and commented on theSuppressed Transmissioncorpus. He’s up to number 123 as of this writing. And that’s out of just over 300 columns. Skim that thread. Look at the panoply of madness those columns cover. If those ideas tickle your mind, just remember there are so many more to be uncovered in a full collection. As is the nature of topics of conversation on the internet, the fate of Suppressed Transmission has come round again. The state of affairs hasn’t changed much. The publisher has to see that releasing the rest of the columns in some form is going to be a money-making proposition. For that to happen, there has to be a rise in sales of the existing collections — both in PDF, only the second still in print. Rally round the flag and support the movement to show there’s a market for a complete Suppressed Transmission collection. Hop in forum threads, talk it up with your friends and most importantly, buy the books! At the very least, they make for entertaining reading and at the very best, they offer oodles of ideas to cram into your role-playing games. 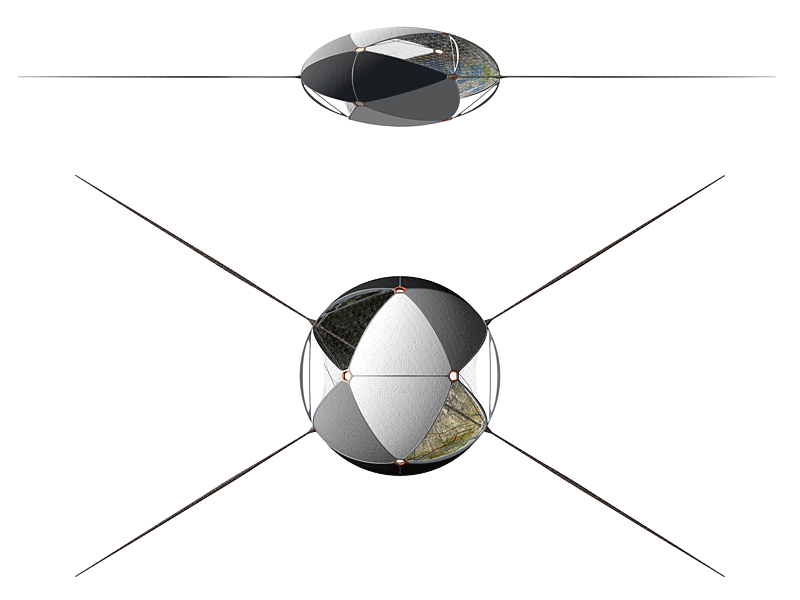 An orthogonal view of Globus Cassus. The Invisibles refers to the Kardashev scale, a speculative system of measuring a civilization’s technological advancement based on the amount of energy and resources it can wield. Loosely, a type one civilization uses what’s available on its local planet, type two can take advantage of the local star, and so on. A civilization capable of building Globus Cassus might be the pinnacle of type one — unless it took more energy than the planet contains to retrofit it into a hollow sphere. Picture it: the Earth is mined for the material making up the core. That material is piled up on the outside and arranged in various ways. The squashed sphere of Earth becomes more like a flattened egg. Some portions of the exterior become windows to let in light from the sun. Humanity lives on the portions of the interior where centrifugal force generates gravity, which provide more than ample living space. Low gravity and airless zones have specialized purposes: manufacturing, storage and so on. Exerting that level of control over one’s environment must be a step on the road, probably an early one, to becoming peers with civilizations like the People or the Culture. How big — and ridiculously well-equipped — would an interstellar empire have to be to decide, “You know, there’s nothing happening in that star system. Let’s hollow out some planets to create habitable space”? On the other end of the timescale, an excavated world would be a fascinating artifact of a bygone civilization to run across in the deep of space. It’s a bit like Ringworld, but I’m put more in mind of Terry Pratchett’s Strata, for some reason. Maybe it’s the psychological component of going down into the hollow world. The exterior hides its secrets. Explorers “descend” into the unknown. There could be anything down there: bug-eyed monsters, detrimental robots, anarcho-syndicalist communes scraping by, anything! It’s gnarly and a bit more atypical than yer Dyson sphere or ringworld. I like it. A flattened icosahedron, no less! Come to think of it, I am reminded of the Draconis campaign frame in GURPS Bio-Tech, only remodeling the planet instead of terraforming it. I keep a pocket notebook in my bookbag for the scrawling of notes and ephemera to remind myself something at a future date. Occasionally, my notes are a little too ephemeral. Last night, for instance, I found the phrase “abecedarian arcana” on a line all by itself. The uses of the word generally have to do with the alphabet: ordering it, learning or teaching it and so on. Now I’m not sure why I wrote “abecedarian arcana” down, as it doesn’t seem to be a title or name for anything on a cursory search. It was probably a turn of phrase that popped into my head one day. It immediately puts me in mind of one of Unknown Armies‘ less well-known schools of post-modern magick, anagram gematria (also known as A Grammarian Gate). What sort of power does a magician wield through the ordering of letters? They’re the visual symbols for the sounds we make to talk to each other. By changing the qualities of letters, maybe one could obscure meaning or remove certain words from consciousness. Interestingly, the Abecedarians were a 16th century Christian sect that eschewed human knowledge and instruction, believing God would grant them knowledge directly. I wonder how they managed to pass on their teachings.